Loneliness and isolation were some of the greatest challenges facing the elderly today. SADeaf YouthBeat in collaboration with Thye Hua Kwan (THK) Bedok Radiance Senior Activity Centre (SAC) organised a fun-filled day on 29 March 2014 to bring the elderly and deaf participants together through social and recreation activities. 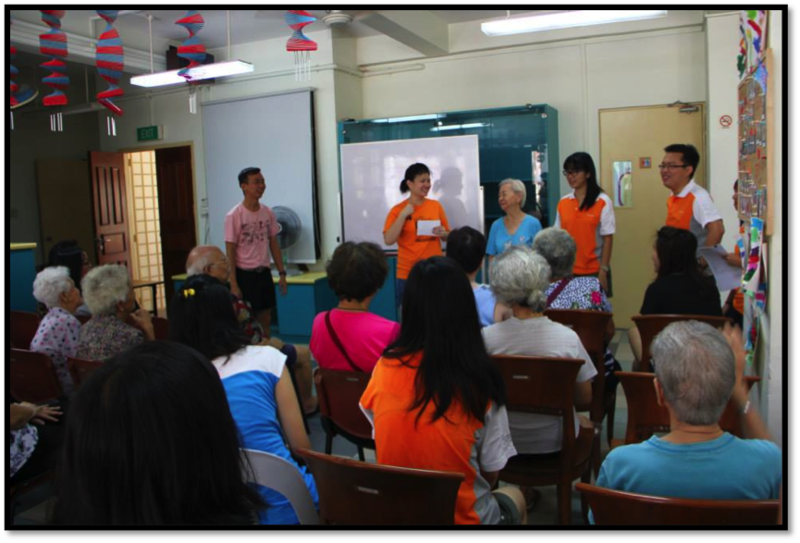 A total of five deaf participants and 13 volunteers gathered at THK Bedok Radiance SAC on a Saturday morning. The day started with the game of charades where one participant was chosen to act while the remaining guesses the word. The elderly were shy and hesitant to act initially but through the facilitation from the volunteers they began to slowly open up. Joy and laughter soon filled the activity centre and the participants clearly enjoyed the game. 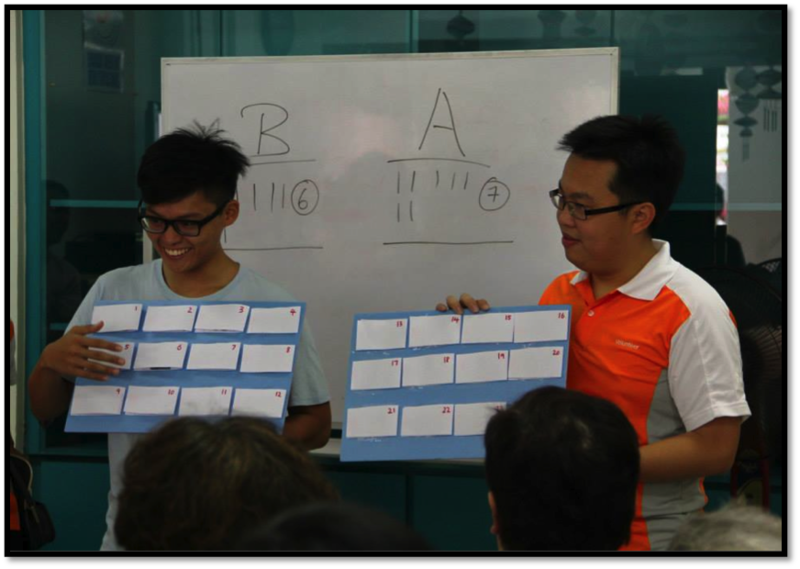 The second game was a memory game and it was designed to stimulate the elderly mentally so that they could maintain and sharpen their cognitive skills. The game ended earlier than expected and the elderly had impressed us with their superb memory skills. The game which the elderly and Deaf participants enjoyed the most came as a surprise to us – Bowling! Plastic Bowling Pins were placed on the ground and the participants completed against each other by knocking down the pins. The elderly were thrilled and jubilant throughout the game. We could not feel any age barrier between the elderly and the deaf participants. Such joyfulness was contagious and it had made us appreciate the simplest things in life. The elderly were enthusiastic to learn about the Deaf culture. The Deaf participants taught the elderly simple sign language such as “I love you” and “Thank you”. The elderly signed “Thank you” to us as we parted our ways. This was indeed a successfully event where the elderly and Deaf had the chance to interact and learn from each other. Last but not least, we would like to express our heartfelt thanks and appreciation to all the volunteers and THK Bedok SAC staffs who had made this event possible. 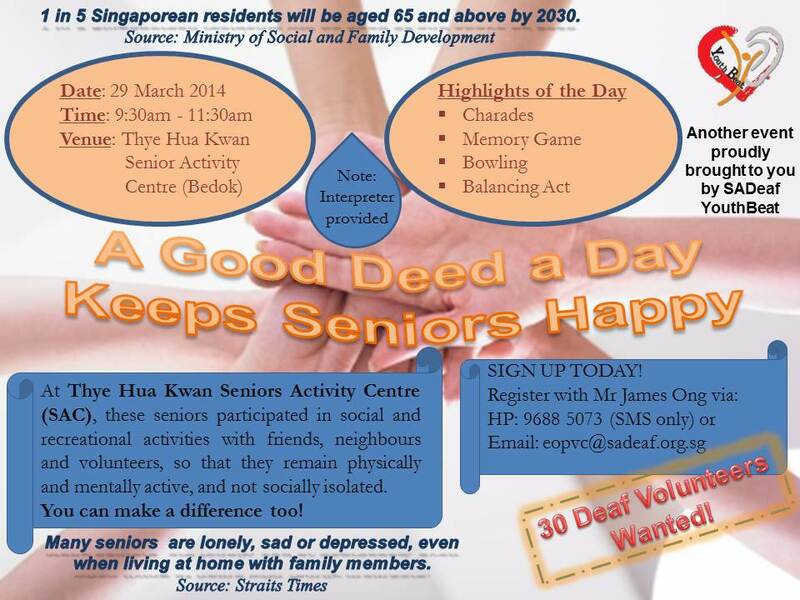 If community service is your beat, come on down to Thye Hua Kwan Activities Centre this Saturday for some volunteering work with senior citizens! See you there! To sign up, register with James Ong at 9688 5073 (SMS only) or at eopvc@sadeaf.org.sg. SOTW 12: What Subjects Do You Study? The March school holidays are here! However, knowing the Singapore, our children are probably taking enrichment lessons or catching up with the curriculum. The signs for Science, Chemistry, Biology and Physics are the same except for the hand shape, which are A, C, B and P respectively. See our video on fingerspelling for reference. Starting this month, YBlog brings you our monthly update – YBulletin! Learn about events organised by YouthBeat that you can look forward to in the near future. As the events approach, we shall post further updates with more event and sign up information. So keep an eye out for them! Now you’ve learnt how to spell and count, what else can you do (besides telling people your IC number)? We think it’d be great to learn how to wish them a happy birthday! Tell us which version you like the most! How do you sign the number 1? Do you use your index finger or thumb? How about the number 6? Are you sure? It isn’t an uncommon experience to find ourselves staring in confusion at the many different ways, sometimes unbelievable, that people sign their numbers. If only we could all decide on one system! Well you’re at the perfect place then! Now we’ve learnt to sign our ABCs, it’s time to get started on our 123s. 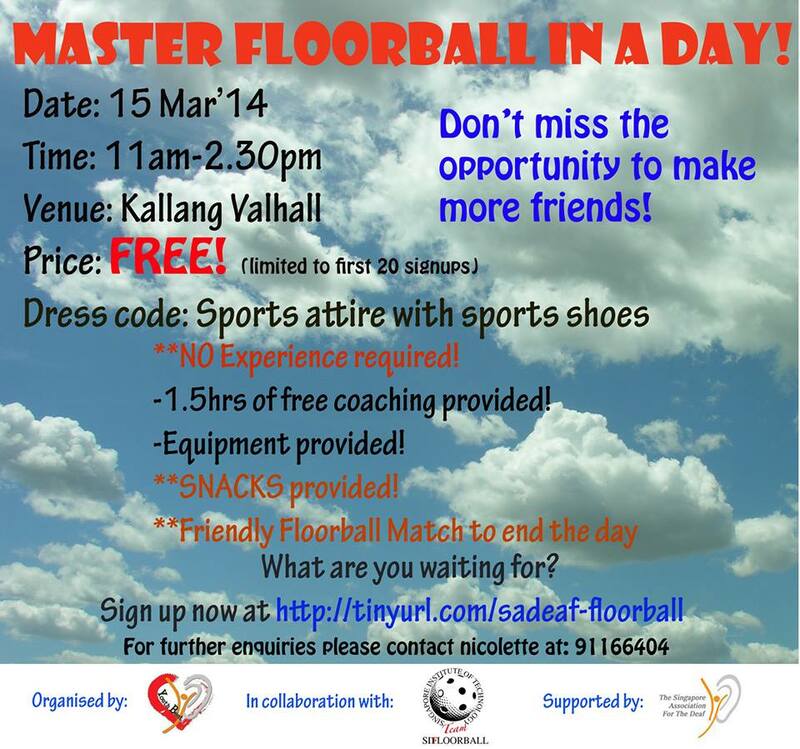 Event: Master Floorball in a Day! Thinking of picking up floorball? Or perhaps you’re already a pro? 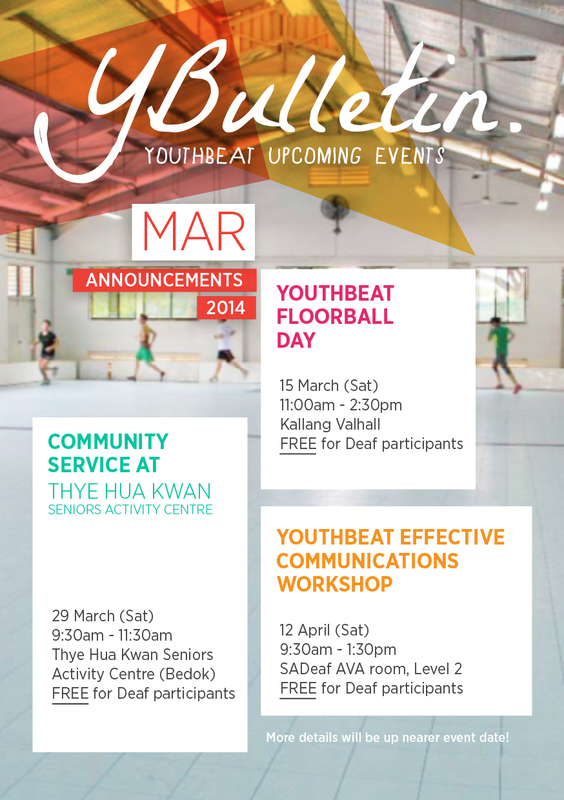 No matter where you stand, come join YouthBeat for a day of floorball fun! Learn how to play the game from our awesome instructors and end the day with a friendly match – and perhaps a friendly meal with your new-found friends. Absolutely no experience is needed. Now you’ve learnt fingerspelling, you can start introducing yourself! Members of the Deaf community usually have sign names, which incorporate an aspect of the person’s name with the sign of their favourite activity or most prominent feature. When introducing yourself, it is customary to first give your sign name then spell out your full name. When interacting with a group of deaf and hearing people, you should also indicate if you are deaf or hearing. Think you know your alphabet so well you can recite it backwards? Well, time to try signing it! 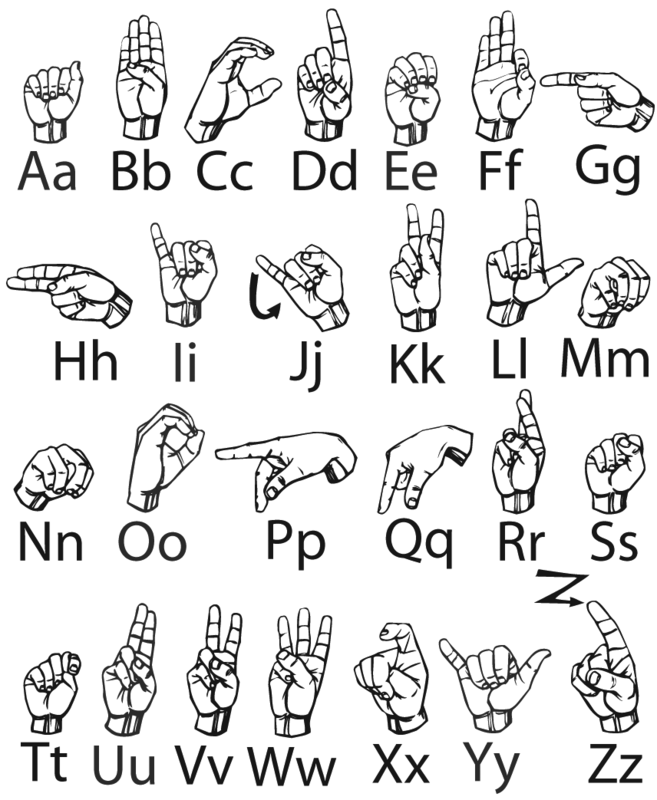 The SgSL fingerspelling is based on the ASL fingerspelling. In fact, they are identical except for the letter ‘T’, which has been modified because the original sign is offensive in the local context. Fingerspelling is integral to sign language and is used mainly for names and words that lack signs. Once you master it, you can pretty much communicate anything you want! Here’s a ASL Fingerspelling chart. Note how the letter ‘T’ differs from the video. SOTW 06: Will You Be My Valentine? Valentine’s Day is coming up! Get the stammers just thinking how you’re going to ask your crush out? Why not sign it? It might just win their heart over.